Too many travellers embarking on a trip through Spain’s Andalucía stumble upon the city of Granada with only one thing in mind: The Alhambra. As one of the most visited attractions in Spain, many tourists who set foot in this southern Spanish city come only for that and fail to see what more Granada has to offer. While many might treat it as a day trip from nearby Málaga or even Seville, spending 2 or 3 days in Granada is one of the best decisions you could make. With an incredible history, beautiful architecture, and one of the best gastronomic scenes in all of Spain, making time to include Granada as a stop on your Andalucía itinerary is worth every minute you spend there. So if you’re wondering what to do in Granada for 2 or 3 days, follow this guide. How Many Days in Granada? Before I get into this Granada itinerary, lets discuss how many days you should spend in the city. Like I said earlier, far too many people assume that Granada’s only merit is the Alhambra and therefore think that there isn’t much to do in the city beyond that. However, that is certainly not the case. While the Alhambra is 100% worth visiting, there are so many other things that make Granada worth visiting that you need to spend at least 2 full days in the city to really do it justice. With 2 days in Granada, you can assure that you can visit the Alhambra and give it the proper amount of time (you need at least 3 hours to be able to see everything there! ), but also be able to visit great historical sites like the Granada Cathedral and explore the neighbourhoods of Albaicín and Sacromonte. You will also be able to experience what is arguably the best tapas scene in all of Andalucía. So, if you can, try to spend at least 2 days in Granada. However, if you have longer to devote to your time in Southern Spain, you can enjoy the city far more if you spend 3 days in Granada. This way you can dig deeper, see more sites, and explore some areas and neighbourhoods further. Spending more than 2 or 3 days in Granada is also highly recommended if you can budget the time for it. The city makes a great base for a number of fantastic hikes in the Sierra Nevada and day trips to nearby towns and cities. It would also give you more time to experience the laid-back nature and good vibes of Granada. Now that you’ve figured out how many days to spend in Granada, we need to discuss how you’re going to get to and around the city. Granada is one of the biggest cities in Andalucía and, therefore, is well-connected to other major metropolitan areas within the region. There are frequent bus and train connections with cities like Seville, Málaga, and Córdoba and other, smaller cities as well. The bus and train station is located about three kilometres outside of the city centre and it is necessary to take a bus or taxi into the city. Buses are frequent and you can buy a ticket directly from the driver for €1.40 each. If you’re visiting Granada as a stand-alone trip, there is an international airport located close to the city centre that serves European cities like London, Berlin, and Milan along with some destinations within Spain. If you need to get into the city centre from the airport, there is also a frequent bus that will take you directly to the Gran Vía. Once you’re in Granada, you will find that most everything of interest to tourists is within easy walking distance of each other and it is unlikely that you will need to use public transport or taxis at all. If you have rented a car to get around in Spain, it is advisable to keep it in a car park during your time in Granada, as the streets can be incredibly narrow (especially in the Albaicín) and it is altogether very difficult to drive in the city. As stated eariler, the best way to get to see and do everything that Granada has to offer is to spend two or three days there. If you only have 2 days in Granada, then follow the first two days of this itinerary, as the third day is added on to build upon the first two. The first day of this Granada itinerary sees you exploring some of the monuments of the city that don’t include the Alhambra. Today is the day you will take the time to learn about Granada’s history, get lost in its Arab quarter, and learn what it means to tapear. The first stop on your first day in Granada should be in the city’s historical centre. This is where all of Granada’s biggest sites besides the Alhambra lie and there is a lot to learn about the city here. If you’re interested in getting your bearings and learning about Granada away from a website or guidebook, then we suggest going on a free walking tour with Walk in Granada. Their essential Granada tour meets every day at 11 AM in the Plaza Nueva and will take you past all of the city centre’s top monuments and briefly into the Albaicín neighbourhood as well. You will also be able to get some historical context on the places you’ll be visiting during your 2 or 3 days in Granada as well as great local recommendations. After the walking tour, take the time to venture off and explore areas of the historical centre on your own. Highlights include the Granada Cathedral and Royal Chapel, where you can see the tombs of King Ferdinand and Queen Isabella — the Catholic monarchs who reconquered Granada commissioned the Columbus expedition in 1492. Nearby to the Cathedral is are a series of winding streets that act as something of a bazaar, full of middle eastern-themed souvenirs and Spanish tiles. Though there are shops like this selling the same things along many streets in Granada, these streets can still be fun to wander through. If you are looking for a quieter and more off-beat attraction in Granada’s centre, then consider visiting the Monasterio de San Jerónimo, which is only about a 5-minute walk from the Cathedral. It is also a great example of a religious building that was once a mosque, turned into a church as is common throughout the region. After exploring the centre of Granada, it’s time to venture a bit further north in the city and explore the historic Arab quarter of the Albaicín. Now a UNESCO World Heritage Site, the Albaicín is famous for its whitewashed buildings and narrow cobbled streets. Though you could easily get lost in the winding streets of the quarter for hours on end, it can be worth it to take a tour of the neighbourhood in order to get a better historical context of the area. Walk in Granada also offers a free walking tour of the Albaicín that meets at 4 PM every other day. The tour will take you all over the Albaicín and cover how the neighbourhood has changed during its centuries-long history, including the challenges it is facing today. For instance, the Albaicín — which used to be one of the worst neighbourhoods in Granada — is now considered to be the most expensive and highly sought-after in the city. This has resulted in skyrocketing housing prices and many locals have been edged out of the neighbourhood because of that. However, the Albaicín wasn’t always a tourist hotspot. It was once the Arab quarter of Granada and there is a ton of history throughout its beautiful, winding lanes. If you are curious about what a traditional Albaicín house would have looked like, you can visit the Casa de Zafra museum. This is a converted house of a once-nobleman that has been restored and opened to the public. It will give you a great idea of how the wealthy used to live in the quarter centuries ago. After spending a couple of hours wandering around the peaceful Albaicín, it is time to head to one of the most iconic viewpoints in Granada, Mirador de San Nicolas. This viewpoint is famous throughout Granada as the spot where then-US president Bill Clinton said in 1997 that he saw the “best sunset in the world.” Though you can’t see the actual sunset from the viewpoint, the views of the Alhambra and the Sierra Nevada are absolutely stunning, especially as the sun is sinking below the horizon. Keep in mind, however, that the St Nicholas viewpoint is probably the most popular of its kind in Granada and you are likely to have to fight for a good view through a myriad of camera-wielding, selfie-happy tourists. This doesn’t necessarily take away from the view in any sense, but don’t plan to have a romantic view all to yourself when visiting this iconic spot. After all of the sightseeing of the first day of your 2 or 3 days in Granada, you’re bound to have worked up an appetite. Luckily for you, Granada has some of the best and most unique tapas culture in all of Andalucía and no visit to the city is complete without sampling it at least once. So in the evening of your first day, forgo trying to find a table at one restaurant for dinner and opt to go on a tapas crawl instead! While it is almost certain that you have been to a Spanish restaurant or tapas bar in your home country, it is time to throw everything that you think you know about tapas out the window! The culture here is copletely different to what you’re used to at home. First things first, in Granada, tapas are included with a drink order. If you order a beer, glass of wine, or even a soft drink at a bar in Granada, you will get a small plate of food along with it. With each subsequent drink you order, you get another plate of food. While there are some places in Granada where you can choose which tapa you would like from the menu, it is more likely that you will just be given a plate of food by the waiter without any choice whatsoever. There is also not usually an option to order multiple plates of food, like you might do elsewhere in Spain or at a tapas restaurant at home. What you can do if you want more to eat is to order a half or full portion (media ración or ración in Spanish respectively) of a house speciality. However, it is just as acceptable to either order another drink or to move onto another bar. Another thing to keep in mind when you are going out for tapas (tapear in Spanish) is not to be intimidated if the bar is very busy and loud. Most bars might have a handful of stools, however, if they’re good and popular, it is likely they will be standing room only as they fill up. Assert yourself, push your way through the crowd, and get used to standing while eating if you want to have a truly local experience. If you want some great tapas recommendations, pleae check out the “Where to eat” section below. The second day of this Granada itinerary will see you exploring the most iconic attraction in the city: The Alhambra. The entire complex is massive and will most likely take up the majority of the day, however, no visit to Granada is complete without it. On day 2 of your 2 or 3 days in Granada it is time to climb up the hill and visit the Alhambra. This incredible monument consists of many different sites including the Nasrid Palaces, the Generalife, the Alcazaba, and a fine arts museum. Each section takes some time to visit so make sure you plan your days accordingly. Before we talk about what to see at the Alhambra, let’s talk about getting your tickets to visit this amazing Moorish palace and fortress. As one of the most popular attractions to visit in all of Spain (more than 2 million people visit every year), you need to make sure that you book your tickets well in advance, especially if it’s not in your Spain travel budget to spring for a guided tour. There are two different tiers of tickets you can purchase for the Alhambra if you want to visit on your own without a guide. If you are on a tight budget, you can only purchase tickets for entry into the gardens, Generalife, and Alcazaba. These places are all very worth visiting and you also won’t have a timeslot for entry, so you can arrive whenever you would like. These tickets cost €7. The second tier is for entry into all of the aforementioned areas along with the Nasrid Palace, which is the most iconic area of the Alhambra and what you probably picture when you think of it. I would highly recommend spending the extra €7 to visit the palaces if you can as it is very much worth it. If you have a general admission ticket (which includes the Nasrid Palace, Generalife, and Alcazaba), then you will have an admission time on it. However, this admission time is only for the Nasrid Palaces, where they only allow people to enter in 30-minute intervals. This means that you don’t need to arrive at the entire Alhambra complex at the time printed on your ticket, only the Nasrid Palaces, and therfore you can arrive at whatever time you please on the date to see everything else. All in all, we would recommend planning to spend, at the very least, three hours at the Alhambra in order to try and see everything. It is truly worth it and it is one of the most fascinating a beautiful monuments of its kind in the world. If you don’t happen to be able to get tickets to the Alhambra on the dates you plan on spending 2 or 3 days in Granada, it is possible to visit the monument via guided tour (click here to check availability). This will cost significantly more than going on your own, however, you do get the added benefit of having a certified guide explain everything that you’re seeing. After you’ve spent your morning exploring the amazing complex that is the Alhambra, it’s time to explore another area that makes Granada a unique location to visit in Spain: Sacromonte. Sacromonte was traditionally the Roma neighbourhood of Granada and still, today, is home to those who live a more alternative lifestyle. Nestled in the hills to the northeast of the Albaicín, Sacromonte is perhaps best known for it’s cave-houses. Because of the intense heat that Granada experiences in the summer months and also due to the fact that the neighbourhood has traditionally been much lower-income than the rest of the city, most of the dwellings in Sacromonte are partially or compleltely part of a cave dug into the mountain. The vast majority of the houses in Sacromonte today, however, are just that: houses. Though most of the house is still dug into the mountain, the front of it looks just like any other house in that area of Granada. There are also some shops and restaurants where you can see just what a cave house looks like inside. While most people in Sacromonte live in proper houses, there are still very much some cave dwellings where people actually live higher up in the hills. These caves do not have running water or electricity and the people who live there must get water from a communal tap nearby the dwellings. 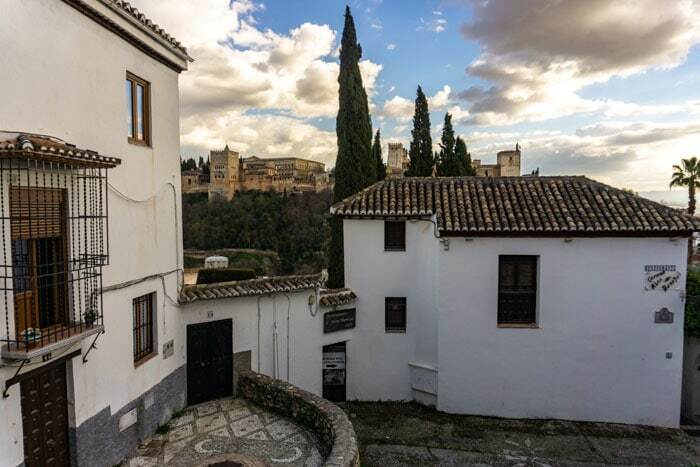 It is possible to take a free tour of the Sacromonte neighbourhood with Walk in Granada if you want to find out more and also go for an easy hike up to some of the highest points in the city. The tours leave every other day at 4 PM and it is well worth it. If the Mirador de San Nicolas was too crowded for you, then you are sure to love the San Miguel Alto viewpoint. As one of the highest points in the city, this isn’t a vewpoint that many tourists choose to visit as it can be a bit strenuous to reach it, especially on foot. The hike to the viewpoint is well worth it, however, as it offers some of the best views of Granada below and the lovely Sierra Nevada surrounding the city. It also attracts a much more local crowd, looking for a chilled out place to hang out with their friends and to drink a couple of beers. Compared to San Nicolas, San Miguel Alto isn’t nearly as well-maintained, but the views are even more impressive, making it an excellent place to head on this 2 or 3 days in Granada itinerary. If you’re wondering about a great way to end day two of this Granada itinerary, then it would be to head to a flamenco show. Granada claims to be the birthplace of flamenco (as do Seville, Jerez, and Cádiz, so you need to take that with a grain of salt), but the traditional flamenco you will see here is different from what you will find in other cities in Andalucía. Flamenco in Granada does not typically take place in a bar or tablao, it takes place in a cave in Sacromonte. While there are certainly theatres where you can see a flamenco show in Granada’s city centre, these tend not to be the intimate experience that flamenco should be. While the act is almost exclusively for tourists in Granada these days, that does not mean you shouldn’t go to a show. Tourism keeps the art alive. If you want to have the best value and most authentic experience, see a flamenco show with Zambra María la Canastera. This place puts on traditional Granada flamenco in a converted cave in Sacromonte. The €22 ticket price includes a drink as well. If you are able to spend more than 2 days in Granada, then this third day is the perfect way to end your time in the city. It sees you heading to some areas outside of the typical tourist trail, taking part in one of Granada’s age-old traditions, and spending more time in your favourite areas. Granada isn’t all Arab quarters, cave dwellings, and Moorish palaces. There is also a thriving street art scene in some great areas of the city. There is a great walk you can do from the Plaza Nueva along Calle de Molinos straight to Plaza Joe Strummer (yes, it is named after The Clash guitarist — he used to be a Granada resident!) where you can see works of art from Granada’s own El Niño de las Pinturas. There are many incredible murals decorating the streets of Granada, but one of the best streets to see it is Cuesta de Caidero. Going on a street art walk is an excellent way to spend some of your 3 days in Granada and helps you to see the creative sie of the city, away from the bigger tourist attractions. Another fantastic thing to do during your time in Granada is to take part in one of the best traditions that the city has to offer: buying cookies from cloistered nuns. Though you can find this in many cities throughout Spain and Andalucía in particular, there are numerous convents where you can purchase delicious homemade sweets from cloistered nuns in Granada. The concept is simple: because the nuns are cloistered, they avoid direct contact with the outside world. Therefore, the entire interaction takes place without ever actually seeing anyone. Basically, you walk up to a window where there will usually be a sign telling you what they have and the prices. You ring a bell and the nun will open the window to reveal a lazy Susan-like turntable. You place your order, put your cash on the turntable, and the nun will turn it around with your cookies and your change. This is a fascinating experience and not that well-known amongst tourists, but it is something that we became slightly obsessed with during our time in Granada and sought out a number of convents to buy cookies from. This is how the nuns earn their livelihoods and pay their rent, and it is also likely not going to be a tradition for much longer, as fewer and fewer women are opting to join convents at all, let alone become cloistered. Some of the best places to buy sweets are the Convento de Zafra, the Convento de Santa Isabel Real, and the Real Monasterio de la Encarnación. After you’ve seen the street art and bought some cookies, it is time to head back to either the Albaicín or Sacromonte neighbourhoods and allow yourself to get truly lost. While you may have gone on a walking tour the past couple of days, spend today exploring on your own and seeing where your feet take you. It doesn’t take long to venture away from the tourist crowds in the lower Albaicín and for you to experiecne the peace and tranquility of these centuries-old neighbouthoods. The last stop on your three days in Granada itinerary should be one final tapas bar. There are so many amazing places to eat in Granada, that you need to spend more than just one night out to experience it. Follow some of our suggestions below, but trust your gut if something looks good to pop into. A great tip for finding a fantastic bar is to see just how crowded it is: if it’s standing-room only and loud with people’s voices, then chances are it’s a great find and you need to shove your way in! Granada’s tapas culture is something not to be missed! If you have more than 3 days to spend in Granada, then it is the perfect opportunity to take advantage of some of the great day trips available from the city. If you are interested in hiking and nature, it is incredibly easy to get to the Sierra Nevada and embark on a day hike. If you happen to be visiting in winter, you can also go skiing in the mountain near Granada. If you’re more interested in seeing some other cities and towns in Andalucía, then there are numerous options that are within easy reach of Granada. If it is a larger city you’re after, Málaga can make a great day trip if you’re after some sunshine and culture. Jaén to the north of Granada is a far more off-the-beaten-path option, but it does produce the majority of Spain’s olive oil and has a fantastic tapas culture. Other fantastic options for day trips from Granada include Pampaniera in the Alpujarras and Monachil, which is easily accesibly by Granada city bus. Bodegas Castañeda — If you’re looking for a great place to eat in the busiest part of the Albaicín, then this bar is the place for you. It does get incredibly busy, however, that just means that its food is fantastic. They have both a sit-down restaurant and a bar, but keep in mind that you cannot order tapas off the menu if you sit at a table — you need to stand at the bar for that! Regardless, you do get a free tapa with a drink regardless of where you find yourself and the food quality is fantastic. Bar Provincias — Another great place to eat in the historical centre, this bar is more popular around lunchtime, where it can get incredibly busy. They are well known for their seafood and give a generous tapa with each drink order. Try to get here early if you want to avoid having to stand while eating. Los Manueles — This is one of the most popular tapas bars in Granada and for good reason, it is delicious. Though it is featured in many touristy write-ups and guidebooks, it retains its authenticity and is an excellent option for a bite to eat in the city centre. You get a generous free tapa with a drink order and they have an extensive menu of 1/2 and full portions available as well. Los Diamantes — This popular tapas bar, serving excellent seafood, has two locations in Granada and both are within easy walking distance of the main tourist sites. They have a range of delicious seafood available and always have daily specials. It gets very busy here, so it is most likely that you will have to stand and eat, however, the food is worth it! Restaurante Oliver — This is a popular restaurant and bar located close to the Cathedral, making it an excellent place for a drink or a bite to eat while exploring the historical centre. They specialise in seafood, however, they have a varied menu of tapas and raciones that are both affordable and tasty. Bar Ávila II — This is a more modern tapas bar located a bit further away from the historic centre of the city. They have a lot of traditional food available and you get to choose the tapa you want with your drink, rather than just being given what they have. It also gets very busy at peak times. Bar Poë — Another modern tapas bar, this place serves traditional tapas with an interesting international twist. Located a bit south of Granada’s city centre, this is another place where you choose your tapa from a small menu rather than it just being handed to you. They also have vegetarian options, which is a rare occurrence in this city. Mesón Rincón de Rodri — Though this tapas bar is located a bit further out than most of the others on this list, it is incredibly worth venturing out to as it was one of our favourite places we ate in all of Spain, not just Granada. This seafood bar offers delicious freshly caught tapas and raciones at affordable prices. They also give you an incredibly generous portion for your included tapa. If you like seafood, then you absolutely cannot miss this place in Granada. Cafe Bar Los Arcos — This is a wonderful local bar in Granada, not located too far from the Granada Cathedral. They have a friendly staff and their included tapas are generously sized. You can also order 1/2 and full portions of their house specialties. Bodega Del Gallo — This is a great local spot to visit on any tapas crawl. Popular with a young crowd, they have a hip decor but operate like a more traditional tapas bar. They have explicit rules that they don’t allow you to choose or change the tapa you’re given and you also cannot order an extra one without another drink. Besides this, the food is fantastic and the atmosphere is great. La Sitarilla — Another traditional, family-run spot, this place is a great stop on any tapas crawl in Granada. They give generous tapas and pour the biggest beers all for affordable prices and it is an incredibly popular spot with locals. Airbnb — If you’re looking for alternative accommodation in Granada, then Airbnb is a good option. There are numerous properties available on the platform and if you’re new to Airbnb, you can click here to get up to $40 off your first stay! Not quite what you’re looking for? Click here to browse more Granada hotels! Spending 2 or 3 days in Granada is sure to be the highlight of any trip through Andalucía. With a broad and dynamic history, thriving gastronomic scene, and many interesting things to do, Granada makes one of the best places to visit in Spain. Are you planning a 2 or 3 days in Granada itinerary? Have you been? Let us know in the comments!